Last weekend, I was chatting to a woman who told me that she was going to Listowel Writers’ Week as the companion of a writer who was going to be honoured with a special award. She was going to get a chance to mingle with the great and the good of Irish and International literature – and she was going to get to do it for free. To my disgust, she wasn’t the slightest bit happy about this, as she’s a teacher and it’s a busy time of the year for her. I was tempted to put myself forward in her place. But before I decided to deem her Miserybags of the Year, I decided to have a good long look at myself. We write for many reasons and some of them are less noble than others. And one of my less noble ones is the glory I imagined would come my way once I was published. I cringe a little now as I think of my fantasies of crowds clustering around me at event, plying me with wine and cocktail sausages, plying me with questions. It’s easy to fall into the trap of putting events and awards at the centre of your writing life, when in fact they are only the trimmings. In reality, they’re a huge anticlimax. I got my first taste of this when I was published in an anthology of writing that was first broadcast on a show called The Quiet Quarter on classical music station Lyric FM. It was to be held at the National Concert Hall in Dublin. Since some of Ireland’s top writers had been included in the anthology, I had visions of wafting around the beautiful, airy concert hall, mingling with the great and the good, a glass of wine in my hand. On the day, hundreds of us were squished into a cordoned area, and the crowds were so dense that the mulled wine was out of reach. The only people I talked to were a woman who said I looked funny and a couple who happened to be eating their sandwiches in the area where the launch was happening. They had absolutely no interest in the launch, but also didn’t leave. So in a way, this woman was right not to be excited about going to the event in Listowel. Events are fun, but ultimately, they don’t mean anything. If you take that attitude, you’ll enjoy the event for what it is. The biggest lesson for me, in both attending and being part of these glittering literary events, is that writing is all about the story, not the glory. 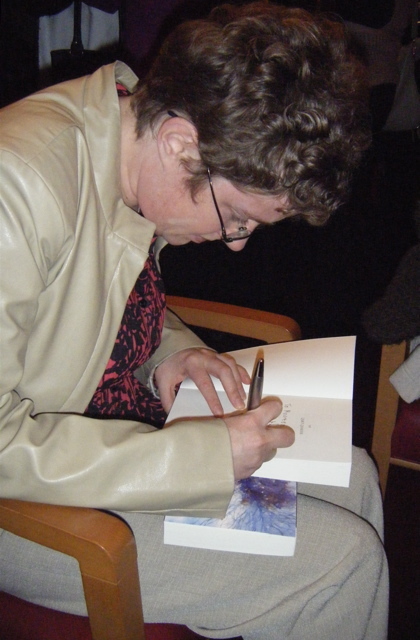 Here’s a picture of me signing the anthology for the two relatives who were kind enough to come with me tot he launch, snatching a few crumbs of glory. As I said in last week’s post about writing and mental health, isolation is a big problem for writers. It’s easier to find support at the beginning of your career. Writers groups and creative writing classes are a natural home for emerging writers. But when you publish a book, you move on to the next phase of your career, and it becomes harder to find a community to support you. A lot of writers are quite self contained and happy to work alone. But I find I need outside stimulus. It gives me huge inspiration. I’ve done my time in writing classes and groups, but I felt myself growing beyond them. Not because I had delusions of genius, but because my reasons for writing were different from a lot of my class and group mates. I want to be a published writer, for the rest of my life. And I needed to connect with people who shared that goal. With the publication of my book, I can’t really say I’m an emerging writer, but I’m not quite an established writer either. I wanted to find writers who were also at that in-between stage. I’ve met plenty of writers online over the last year and it’s been great, but I like being out in the real world, meeting real people. So once a month I have excellent coffee and really excellent conversation with two writers who are at a similar stage to me, with similar goals. Orla Shanaghy has achieved the Holy Grail of getting to read on RTE Radio 1’s Sunday Miscellany and has been shortlisted in a couple of big-name competitions, like the William Trevor Competition and the Fish Competition. Derek Flynn’s first novel is on the point of being picked up by a publisher. He’s had several nibbles already. He’s also a musician, with two albums under his belt. Orla Shanaghy, Derek Flynn and I with self publishing expert Catherine Ryan Howard at our social media panel during Waterford Writer’s Weekend. We share the trials and the triumphs of our writing lives: the rejections, the acceptances, the writers’ block. They allow me to indulge in epic whinges, for which I am eternally grateful. I really appreciate Orla’s sharp, insightful critique, and I’m being slowly converted to Twitter by Derek’s enthusiasm. Their perspectives have strengthened my work, and reassure me that I’m not mad to want to continue to be a writer in the face of what can seem like never-ending obstacles. But it isn’t just a talking shop. We critique each other’s work, point each other to useful resources and concoct schemes to take over the world through social media. 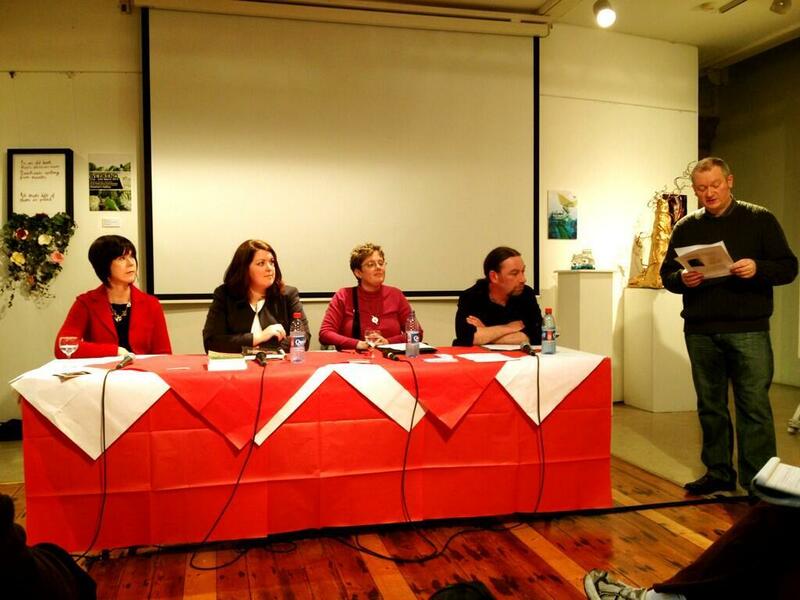 As a result of our collaboration, we’ve had the opportunity to take part in a social media panel during Waterford Writer’s Weekend, which is likely to lead to further social media workshops in the future. And most important of all, there’s the writing. We give each other rigorous but supportive critique. With all of this, we’re helping each other to reach the vaulted plains of established writerdom. Last May, I took part in a very special walk, that started at 4am. 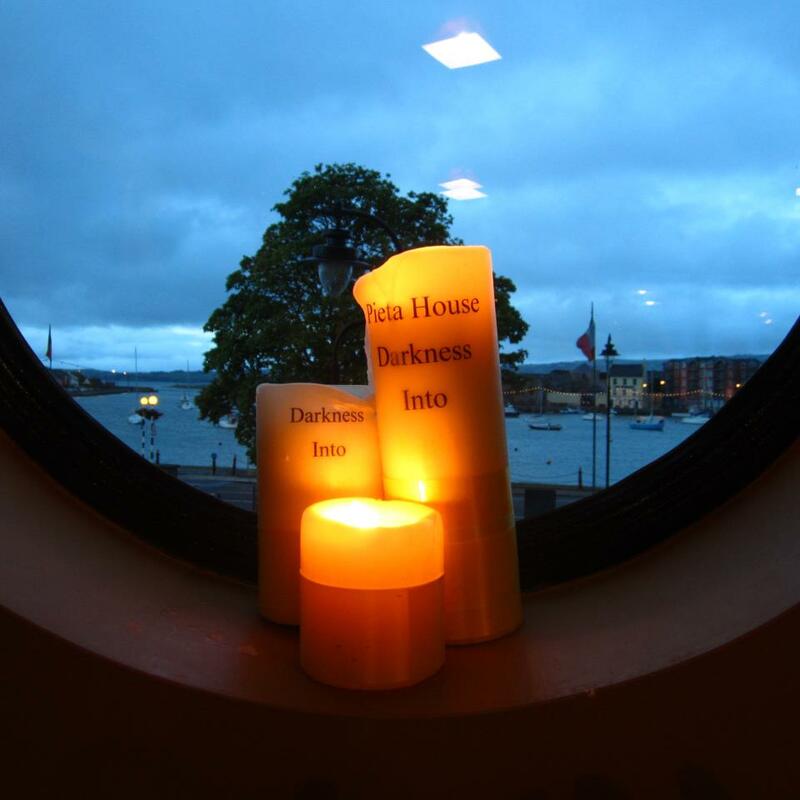 The Darkness Into Light walk raises funds for Pieta House, a non-profit organisation which offers support to people who are suicidal. It was a deeply symbolic walk; the idea of starting in darkness and walking into the light was very powerful. Pic from Deise Darkness Into Light Facebook Page. And it made me think about the interesting relationship writers have with mental health. At one end of the spectrum, you have your Virginia Woolfs and Ernest Hemingways, tortured souls who were tormented by their pursuit of their art and ended their lives. And at the other, you have the delightful eccentrics, writers whose mental health is robust precisely because they’re able to express themselves freely. In some ways, writing is brilliant for your mental health. Writing gives you a way to make sense of the world. You can use words to process your life experiences and shape them in a way that makes them relevant to others. Or you can just have a good rant and clear your mind. When you write, you indulge your imagination and you have the opportunity to play, to express yourself in the uninhibited way that many of us lose once we leave childhood behind. If you’re a writer, you can act a little bit crazy and no one minds, because you’re an artist. If you want to write well, you need to blow off the dust of ordinary life to find the shining everyday treasures that most people miss. To create memorable descriptions, you’ve got to pay attention to what’s going on around you, to find the extraordinary within the ordinary. This makes life a lot richer and more satisfying and naturally boosts your mental health. But writing is also bad for your mental health. A lot of the time, it can feel like you’re toiling away with absolutely nothing to show for it. You write a lot of words that no one ever sees in order to find the ones that are fit to be seen. Even when you muster up a piece of writing that’s good enough to be published and you’re successful, it can feel as if your words sink into the void. That can take a toll on your spirit. There’s a lot of uncertainty and isolation in the writing life. You deal with more rejection in a year than most people deal with in their lifetime. You’re on your own a lot of the time, which naturally gives you time to think. To come up with good ideas, you need to spend quite a lot of time inside your head, which isn’t always a pleasant place. But there’s one thing that’s certain to damage a writer’s mental health, and that’s not writing at all. When you write, even if it never sees the light of day, you feel balanced and in sync. You’re better able to cope with the world. If you feel blocked inside yourself, why not try writing? It may be the path that brings you from the darkness into the light. As many of you who read this blog will know, I’m a compulsive word nerd and in the past 2-3 years, I’ve turned this passion into an editing and proofreading service. Recently, I decided to step up this side of my overall writing business and I embarked on a proofreading course, to help me hone my skills and deliver more accurately and consistently edited copy to my clients. So far, the biggest discovery I’ve made is that we don’t know as much about grammar as we think. I’ve wrestled with questions like, “When does a comma go before an and?” and “Should I break this sentence up with a semi-colon or a dash?” I’m going to share with you some of the lessons I’ve learned so far, which I hope will be useful in your writing and editing work. This is what I was told in my first batch of feedback from the course tutor. Previously, any time, there was a long sentence, the individual sections were divided with commas. Now a long sentence is allowed to flow with as few breaks as possible as long as it makes sense. I’m having terrible withdrawal symptoms as a result of this; I itch to put them into the assignment texts we have to proofread. If a sentence is basically correct, but reads oddly to you, it is best left alone. It’s probably written in a different style to what you would choose and if you as an editor were to remove it, you’d be taking from the author’s original style. If you’re proofreading, unless there’s a glaring grammatical error, carry on. Otherwise you’ll be bogged down and waste a lot of time. We’re so familiar with the words we read that we automatically correct any errors that we see. That’s why typos appear in even the most word-savvy writer’s work. Thin letters like i and l and capital letters can be the hardest to spot. When proofreading or editing, slow down and take in each word, so the errors will become clearer. To find out about The Publishing Training Centre’s distance learning proofreading and copyediting courses, visit www.train4publishing.co.uk.